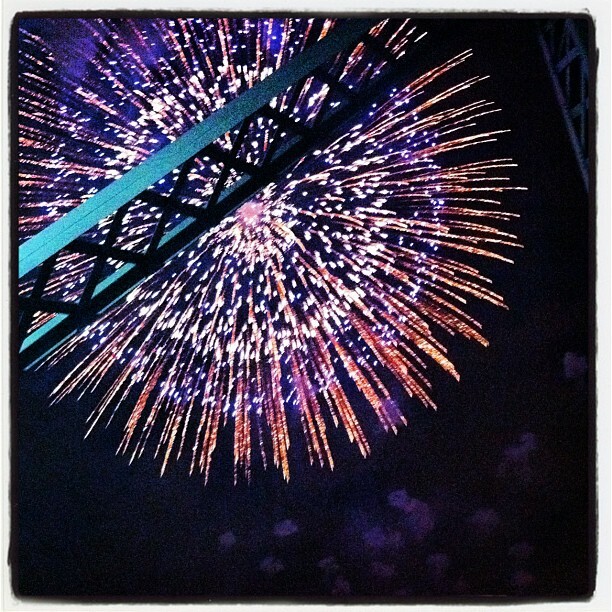 Every summer Saturday at 10pm there will be fireworks from the amusement park. There's a competition that goes on all summer and each participant shows their fireworks on one Saturday night. This only started yesterday and the first country to perform was Japan. I've gone to the park to watch them once every summer I've lived in Montreal but last night was the first time I went to see them from the Jacques Cartier bridge. The bridge crosses almost over the amusement park, so for every Saturday, they close that bridge so people who are not in the park can go see the fireworks from there. It was fun to see them from a different angle. Also, I've now learned that for every nice photo of fireworks you'll end up with, like, ten awful ones.